There was a time when being an “Arab” didn’t mean you were necessarily Muslim. It was a time when Oscar Hayoun, a Jewish Arab, strode along the Nile in a fashionable suit after Shabbat services on his way to bring tobacco to his dying grandfather, long before Oscar and his father arrived at the port of Haifa to join the Zionist state only to find themselves first hosed down with DDT then left unemployed on the margins of society. In that time, Arabness was a mark of diverse cosmopolitanism, of intellectualism. 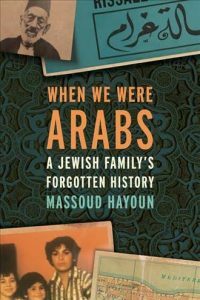 Today, in the age of the Likud and ISIS, Massoud Hayoun, the Jewish Arab journalist that Oscar raised in Los Angeles, finds his voice by telling his family’s story. To reclaim a cosmopolitan, nuanced Arab identity is, for Hayoun, part of the larger project to recall a world before ethnic identity was mangled for political ends. It is also a journey deep into a lost age of sophisticated innocence in the Arab world; an age that until now could be witnessed only in the films his family treasured but that are now nearly lost amid the flood of culture. When We Were Arabs, a stunning debut that showcases the gorgeous prose of the EPPY Award–winning writer Massoud Hayoun, tells the stories of Oscar and Daida, bringing their worlds alive in vivid poetic prose, and in so doing shattering our contemporary understanding of what makes an Arab, what makes a Jew, and how we draw the lines between us over which we do battle.